Oristano is one of the Sardinian provinces and it is located on the west central coast of the island. Hotels in Oristano Mostly flat and easily reachable by car on the SS 131, the province of Oristano is perfect for those preferring uncrowded, long and white sandy beaches. It is set between green plains and wet areas and everyday life is interwoven with long time traditions and modernity. Between the small village of Cabras and the tourist resort of Is Arenas is the Penisola del Sinis, a renowned Natural Reserve with an incredible wet area and lagoon, home of thousands of pink flamingos, cormorants, herons and other protected bird species. From here you can easily reach the well known archaeological site of the Phoenician city of Tharros, founded in the 8th century BC as well as the nearby town of San Giovanni di Sinis with its typical Is baraccas, fishermen huts, and Is fassonis, marsh boats, both made of sedge, a lagoon plant that here extensively grows. Within a short distance Is Arutas, or better known as 'the beach of the rice grains' for its sand grains made of fine quartz affording a kaleidoscopic effect when playing with the sunshine. Never be temped to quartz collection as it is stricly forbidden. Further north Is Arenas, 6 km of sandy shore, coastal dunes and a pinewood with an inland extention of about 700 ha. Hotels in Oristano and Is Arenas Golf course. Moving further ahead the seaside village of S'Archittu (small arch) named after a limestone arch carved by the waves. With its seven meters in height and ten in depth tunnel it is the biggest rocky arch in Sardinia and it has been declared a natural monument by UNESCO. 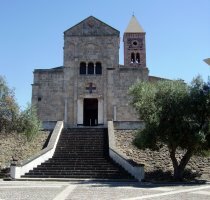 This itinerary through the Oristano province cannot end before visiting the cosy and stone village of Bosa with its multicoloured houses and medieval city centre. Bosa recalls the atmosphere of timeless days, where its people and landscape surround you in a slow motion effect conveying a sense of quietness. 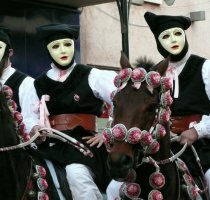 Sardinian culture and traditions are strongly rooted into this province and many villages have proudly preserved their century long traditions, like the Carnival horse parade and contest Sa sartiglia in Oristano or S'ardia in Sedilo, the Corsa degli Scalzi (barefoot run) in Cabras. The handicraft is indeed another important economic resource of the area and some villages may now boast typical and genuine products like Santulussurgiu for its handmade knives called Lussurzesa or Samugheo for its handmade woollen carpets.